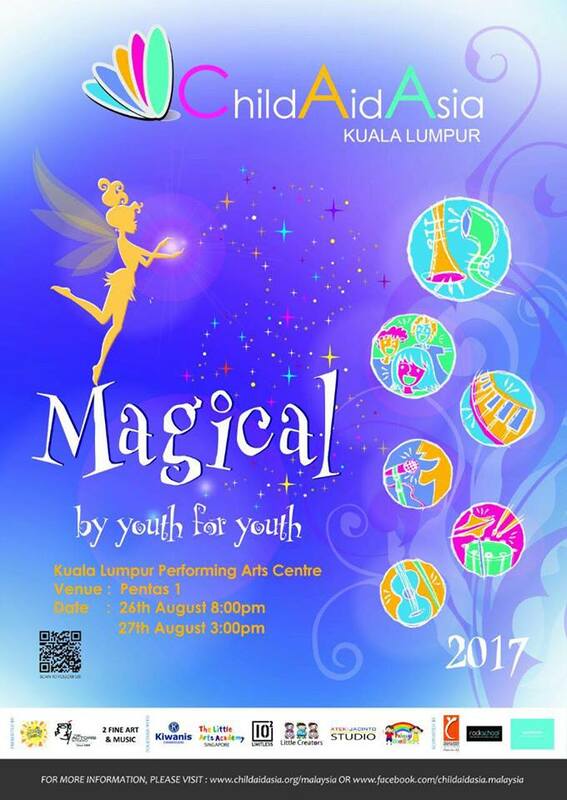 Kuala Lumpur , July 13th 2017 - ChildAid Asia Malaysia , a movement that began over 10 years ago by a handful of enthusiastic individuals to help provide talented but underprivileged and special children with an education in the performing arts , has today become an annual event . Some 100 participants are expected to gather together for this concert - 70% of them local children . Like previous years , the event is designed to get young minds to work together and learn from each other , in the process creating friendship . Today's press conference , Jointly organised by the Kiwanis Club of Damansara and ChildAid Asia Malaysia , announces the details for the concert that will also see the participation of talented young individuals from neighbouring countries . The event was attended by the Director of Kiwanis Club Damansara , Dr Laurence Lim and the co founder of ChildAid Asia Malaysia , Ralph Lim , Wong Siew Ngan and trainer Rockie Siew .
' It is our motto at Kiwanis to promote youth programs . ChildAid Asia is an excellent program and this is our second year supporting this event by raising funds to ensure the continuity of ChildAid Asia education program . We hope to also this year raise more money so that we can share some with Matu Social Organization and also Sunbeam Charity Home ," said Dr Laurence . During the press conference , Ralph also explained that children who are interested in the program must go through a series of auditions . 'It is public's funds that we are using to pay fees for these children's classes . We have a duty to ensure that each child we have selected are musically inclined , so that we can nurture each individual to be a successful Musician.' added that depending on the type of course the child takes up , the fee can cost between RM1,000 to RM3,000 per month . In addition , ChildAid Asia is also tasked to purchase equipment required for each child to practice . This includes violins , cellos , violas and double base . Ralph added that he will also be starting a guitar class soon and as such will be buying 10 guitars . 'As you can see it is a big commitment on our part . Besides audition , we recruit suitable teachers and as the child progress to higher level , they will advance from group classes to private classes . This means the cost will increase . But ultimatum , we are happy when we see the child succeeds . That is our objective , ' conclude Ralph . ChildAid Asia is one program that is meaningful and sustainable for youth who wants to achieve xcellence in performing arts and possibility not able to afford it . Todate , ChildAid Asia is supporting 100 children and they target to sponsor 500 children in the field of performing arts by 2018 . Last years concert saw the event raising over RM80,000 and this year ChildAid Asia hopes to work harder to achieve more . At the press conference , three talented musicians amongst the extraordinary youth that will feature at the concert are violinist Lim Ho Yi , pianist Yap Yi Zhe and beatbox Music player , Lau Jay Earn . The three teenagers delivered a performance at today's press conference , providing a glimpse of this year's ChildAid Asia Kuala Lumpur event . Yap 16 , is an award winning musician . Among his achievements are winning the Grand Prix Award in the junior category of the Asia Paific Yamaha Electone 2014 and winning the silver medal at the Chopin 2012 Competition where he also won the Dato' Ruslan Award. Yap , wh was also the second runner up at last year's UCSI International Piano Festival , takes pride in coming up with original compositions like the song , Spring Harvest that was played at last year's Yamaha Malaysia Junior Original Concert . Forteen year old Lau , for his part , is incredible with his prowess in beatboxing . His talent has taken him to as far as germany , where he was invited to Munich to take part in the super kids talent competition last year . The teenager's love for music began at the age of three with the violin , but he discovered his love for beatboxing at eight and has pursued the latter wholeheartedly since then . Yet another talented teenager who will feature at this year's ChildAid Asia event is Lim Ho Yi , who plays the violin and piano . Lim has since the age of nine , played for different charity concert in aid of underprivileged kids . She is a member of the CAA Amazing Orchestra , a team of children that have raised funds to build a small scholl in Cambodia . Suntory Beverage & food asia Pte Ltd (SBFA) is proud to be sponsoring the fifth edition of the ChildAid Asia Kuala Lumpur Performing Arts Centre . These include providing performers with BRAND'S Ca'ya with Habbatus Sauda & Ginseng as well as Sparkling Ribena to ensure they are energised and hydrated respectively . The subsidiaries will also promote the event to their customers through various online communication channels and give away concert tickets via digital marketing contests .